There is a bonfire right behind Straid, which is accessible once you free him.. If you return to this bonfire at a later time, the mummies will respawn. You'll need to kill them, and Straid is leaning against the wall just to the right as you leave the jail cell. The mummy aggro range is quite small, and if you carefully walk out from the bonfire while hugging the cell bars, you can talk to Straid without drawing any attention. You can trade boss souls with him for Boss Soul Weapons. 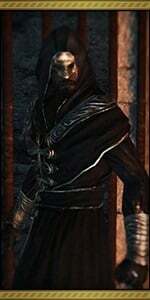 Talk to him after trading 4 boss souls and he will give you the Black Robe Set, which requires at least 16 Int to equip. The hood boosts your spell casting speed. If Straid is killed, either by the mummies or by the player, he re at a cost of 14,000 souls. It'll take several visits for the gravestone to appear. Drops Black Hood if killed. Lost Bastille. Located in the top of the tower closest to the entrance point to the Sinner's Rise, this NPC is initially found guarded by five Undead Citizens, and is petrified. In order to free him from his stony prison, a Fragrant Branch of Yore is required. Once freed, he is available to sell various sorceries, miracles, pyromancies, hexes, and the bonfire behind him becomes accessible. I must thank you, young traveller. I am Straid. A wandering sorcerer of sorts. I've been a guest for a very long time. But I don't think that anybody will miss me! Cursed one, you lack intelligence. Cursed one, weak you may be, but I, Straid, will teach you my spells. Souls! I need souls! You cursed fool! If you seek my strength, bring me souls! Well! This is a most peculiar soul. Well! This is a most charming soul. Well! This is a most twisted soul. Do you really think you can manage the glories that are my spells? Let's hope the magnificence of my spells does not deter you! Heh heh! Long enough for the old kingdom to have crumbled, I see. Long enough for Olaphis to rise, fall, and fade away, evidently. Drangleic… I've never heard the name. Is that what they call this place now? Hah hah…Very good, very good indeed. The cursed ones were imprisoned within this land. The people feared the cursed ones like a plague. Some people would rather keep dreadful things out of sight, out of mind. In the end they swept them up and corralled them here. So very typical of meek minds, don't you think? They seized anybody they found undesirable, cursed or no, and impounded them here. Whoever posed even the slightest threat, was removed. All so that they could sleep better at night. They even turned the great Straid into a stone! Hah hah! Many kingdoms rose and fell on this tract of earth; mine was by no means the first. Anything that has a beginning also has an end. No flame, however brilliant, does not one day splutter and fade. But then, from the ashes, the flame reignites, and a new kingdom is born, sporting a new face. It is all a curse! Heh heh heh! Pyromancy was created by the ancient witch of fire. She harnessed the power of flame, and melded it into pyromancy. The witch led her daughters into war against the Old Ones. How testy, little cursed one! It is heavily implied that Straid made the dispelling ring as the ring description says "There is only one sorcerer who could have done this; a man from the lost land of Olaphis. He also sells the Scythe of Forlom, after killing him 5 times I think. Hi I need the outcry spell but Straid of olaphis doesn’t have for trade ,I must do something ? Was he a Forlon himself? Yeah better lock the Agape Ring behind a stat requirement. forlorn order is wrong. first kill is hood, second is gloves, third is leggings, fourth is chest. i say he has no gravestone 83 reloads and counting and still no gravestone. after dialog he disappeared. where is he? I accidentally agrroed him killing one of the mummies, are there any ways to get him to still trade with me?